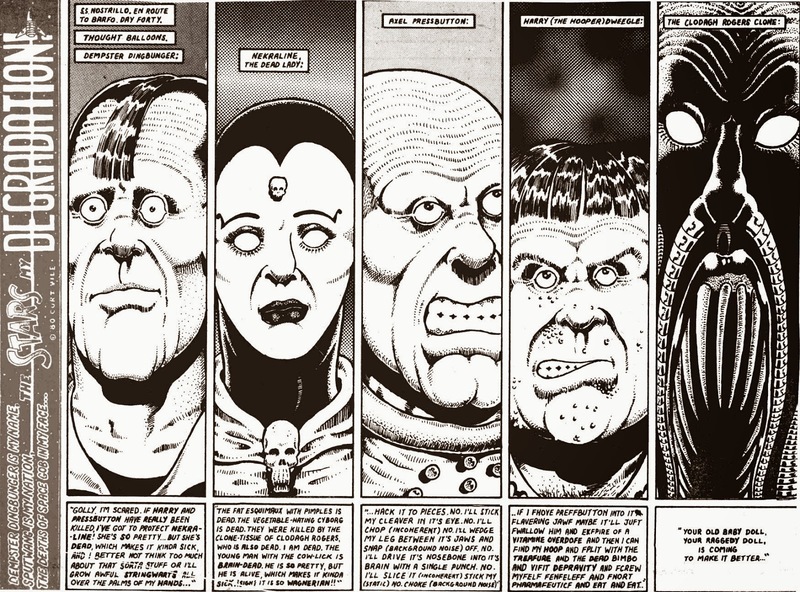 This is the sixth of seven installments of Chapter Three of The Last War in Albion, covering Alan Moore's work for Sounds Magazine (Roscoe Moscow and The Stars My Degradation) and his comic strip Maxwell the Magic Cat. An omnibus of the entire chapter, sans images, is available in ebook form from Amazon, Amazon UK, and Smashwords. It is equivalently priced at all stores because Amazon turns out to have rules about selling things cheaper anywhere but there, so I had to give in and just price it at $2.99. Sorry about that. In any case, your support of this project helps make it possible, so if you are enjoying it, please consider buying a copy. You may also enjoy my newly released history of Wonder Woman, A Golden Thread. By and large, this worked. Moore’s intensely structural approach lends itself well to comedy. This is something that even a cursory examination of interviews with him reveals: he is a terribly funny man. Even when Moore is working with a bit of a shaggy dog punchline he frames it in a precisely worked set of comic beats. 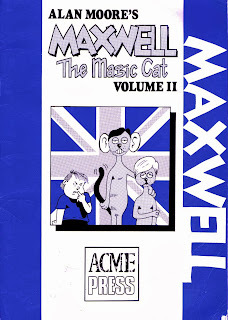 Maxwell the Magic Cat isn’t spectacularly drawn, but it’s reliably funny. Even when it gets political, it does so with the sort of mass market subversiveness that characterizes classic American newspaper strips of the same era like Doonesbury and Bloom County - it’s cheeky, but never over the line of what can be published in a community newspaper. Moments like Moore’s suggestion that laws regarding inbreeding don’t apply to “cats and the Royal Family” might generate an angry letter or two, but it’s not like he was including satanic imagery and blasted skeletons. The edgiest the strip ever got was a ten week series satirizing the then-current Falklands War, in which a storyline about redundancies resulting in supporting characters being given their notice is derailed by a sudden and arbitrary cat/mouse war that causes everyone to forget about the unemployment crisis. Clever stuff, certainly, but given that Moore was busy launching V for Vendetta at the same time, it’s hard to suggest that it’s particularly incendiary. 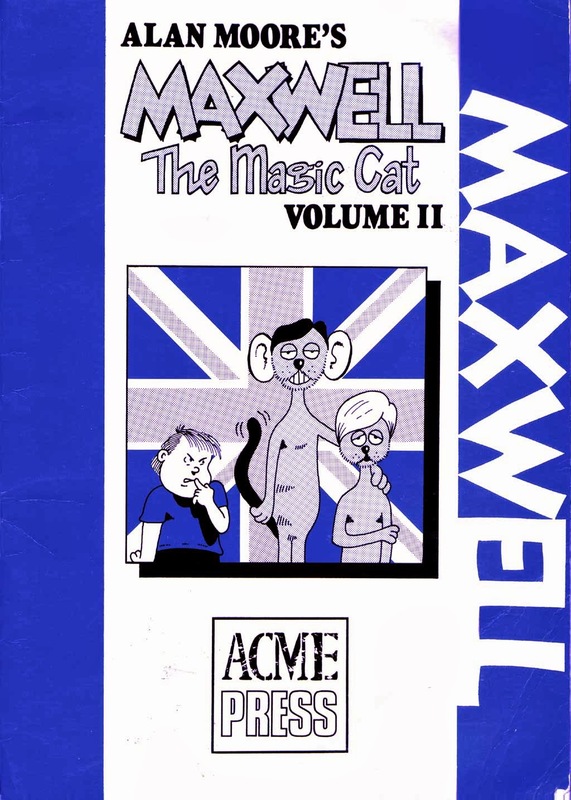 As mentioned, Maxwell the Magic Cat ran until late 1986. The official word in Acme Press’s second volume of collected Maxwell strips is that “Moore dropped the strip due to the pressure of other work, and the Post’s stance on homosexuals’ place in the community. It didn’t feel there should be one.” Both of these reasons are largely believable. Certainly Moore’s workload by 1986 was such that he probably was looking for an excuse. Equally, Moore’s passion on the issue of gay rights is documented (AARGH! came out just two years after he quit Maxwell), as is his propensity for taking decisive action over at times esoteric moral principles. It is also perhaps telling that the well of interesting ideas for Maxwell was visibly drying up towards its end. As the comic wore on the frequency with which Moore put out strips based on fairly pedestrian puns and rather flat gags. One strip consists of Maxwell sniffing a female cat for three panels and then asking if she’s a Sagittarius. As this is only four panels, an opening panel consisting of Maxwell standing and whistling is added to bring it to five. Also, “Sagittarius” is misspelled. But even towards the end there were gems - three weeks later Moore has a particularly clever iteration of his frequent swipes at his own drawing ability. In many ways, then, what’s more remarkable than the question of why he quit is why it took him until 1986 to do so; he had, after all, left the higher-paying Sounds job over three years earlier. Admittedly the Sounds strips were considerably more elaborate, and the art was surely a bigger time sink for Moore, but by the time that the second issue of Watchmen was out the £12.50 a week that Maxwell the Magic Cat was pulling in (roughly £31 in contemporary money) cannot have been a significant portion of the Moores’ monthly income. Moore, for his part, joked towards the end of the run that “I sprinkle shredded dollar bills over my cornflakes these days.” One is left to wonder, then, why he persisted with the strip. mid-80s - its only reprint to date. This is, in many ways, what is most significant about Maxwell the Magic Cat within Moore’s oeuvre - the degree to which it marks him as a very different sort of comics creator. Maxwell the Magic Cat is not some passion project for Moore. Its value was not the extent to which he loved doing it, but rather the extent to which it provided a material engagement with the local world around him. In this regard his eventual departure from the strip was wholly consistent with the strip: a howl of rage embedded firmly in the local community. 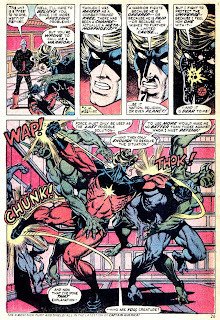 comic featured in Sounds alongside Moore's early work. The other substantial work of Moore’s that falls into this early period is The Stars My Degradation, the second and far longer-running of his two Sounds strips (although he did a handful of one-offs for the Christmas issues of Sounds, all but one of these were in the same setting as The Stars My Degradation). On one level The Stars My Degradation is a clear transitional work between Moore’s earliest work on Roscoe Moscow and Maxwell the Magic Cat and the later sci-fi/fantasy/horror work for which he’s known. On the one hand it’s still in the underground style of Roscoe Moscow, the strip it directly replaces. On the other, it’s a sci-fi strip. Where Roscoe Moscow was based on Moore’s assessment of what Sounds wanted (presumably based largely on the strip he was accompanying on the Sounds comic page, Savage Pencil’s Rock ’n Roll Zoo), and Maxwell the Magic Cat was devised in response to a specific commission, The Stars My Degradation is the first time in Moore’s professional work that he’s gotten to shape a comic to his own interests. And those interests are sci-fi. In this reading, The Stars My Degradation retains the underground styles of Roscoe Moscow, but introduces the sci-fi style Moore will eventually gravitate towards. The problem, of course, is that the chronology of Moore’s career doesn’t support that at all. As noted, by the time The Stars My Degradation started Moore had already begun work for Doctor Who Magazine, with his first story, “Black Legacy,” wrapping around the same time as Roscoe Moscow. Within a few months of its beginning Moore would begin work for 2000 A.D., and while working on The Stars My Degradation he’d do his work with Star Wars, and begin his work for both Marvel UK and Warrior. The Stars My Degradation is, in other words, not a transitional strip, but something Moore undertook while already in the process of switching from his initial career as a writer-artist to a career primarily as a writer. Further complicating this transition is that the end of The Stars My Degradation wasn’t even written by Moore - as of 1982 he was only doing art chores on the strip with the writing done by the pseudonymous Pedro Henry. Where Roscoe Moscow demonstrates Moore pushing himself, The Stars My Degradation consistently feels safer. This becomes clear almost immediately: where Moore challenged himself with increasingly elaborate title splashes, every installment of The Stars My Degradation used a consistent vertical band with a brief comedic rhyme: “Dempster Dingbunger is my name / Sputwang is my nation. 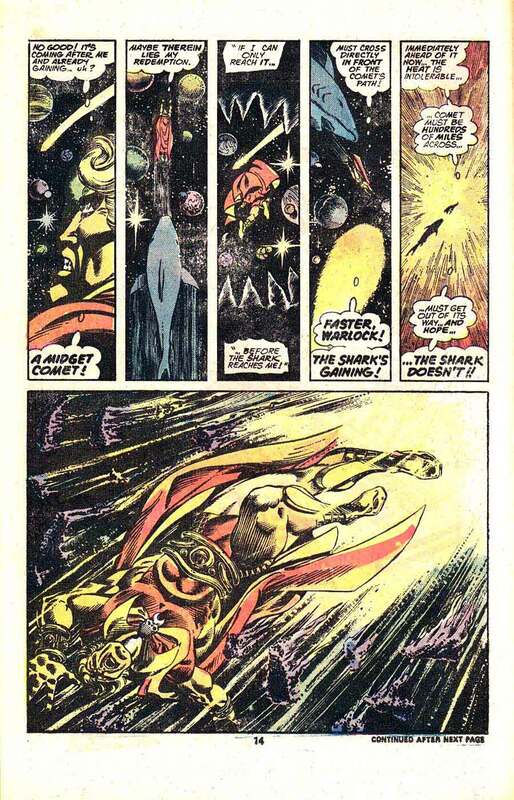 / The depths of space gob in my face…”, with the strip’s title completing the verse. Similarly, Moore largely abandons the complex and ambitious layouts and structures he employed in Roscoe Moscow for a simpler and more direct sort of storytelling, occasionally punctuated by jokes about how he’s blowing his deadlines or strips that are self-evidently constructed so as to allow him to hit them with minimal effort, such as a strip consisting of five tight close-ups of characters faces with lengthy captions providing their thoughts. In this regard The Stars My Degradation feels less like an artistic transition and more like a comics writer trying to scrape a living together. When he started it his Sounds work was still the bulk of his income - the ten quid Maxwell the Magic Cat was making him was a necessary supplement, and whatever he’d made off of his eight pages of Doctor Who work would have been little more than a nice bonus. 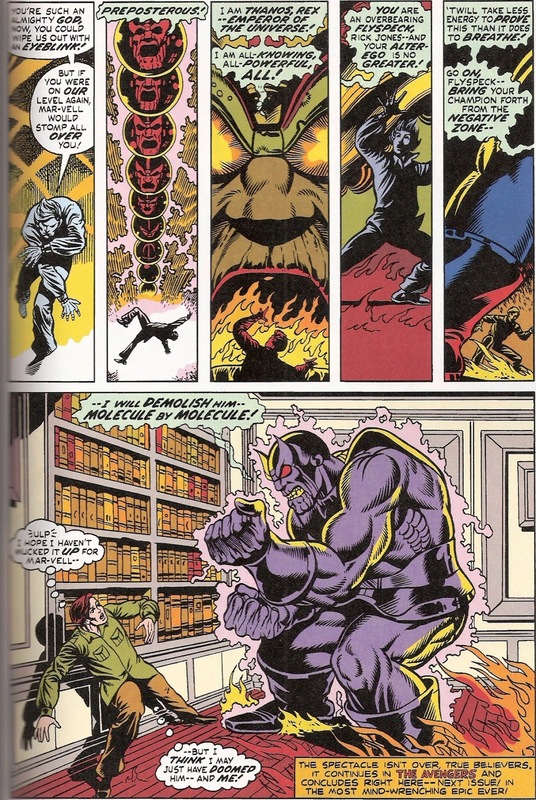 The sci-fi conceit put the comic closer to Moore’s own interests than Roscoe Moscow was, but the overall impression is of Moore making time while he waits to get established doing what he had by this point realized he should be doing, namely writing strips for other artists to draw. That is not to say that The Stars My Degradation lacks interesting moments. 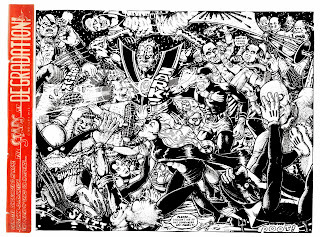 Moore occasionally embraced structural complexity in The Stars My Degradation, and there are several strips he clearly spent time on, most notably a single panel fight scene in the mould of his S. Clay Wilson tribute in Roscoe Moscow, this one including his parody of Marvel Comics’s X-Men alongside cameo appearances from Roscoe Moscow, St. Pancras Panda, Maxwell, and his recurring 2000 A.D. character Abelaard Snazz. He frequently had clever plots as well, particularly early on - for instance, a plot in which murderously psychotic cyborg Axel Pressbutton infiltrates an anarchist cell consisting entirely of police informants trying to infiltrate an anarchist cell. This culminates in one informant, depicted as a stereotypically masked anarchist with a wide-brimmed hat, seen, in his first appearance, actually clutching a lit bomb, having his intended to be impossible plan to blow up the Central Justice Building come off, resulting in the revolution actually taking place. Hmm, I have a reprint somewhere that doesn't look like that one. Maybe it's a different issue. It's red or orange. Yeah, that's probably volume 1 of the Acme reprints. Damn, I vaguely thought I had the whole run. 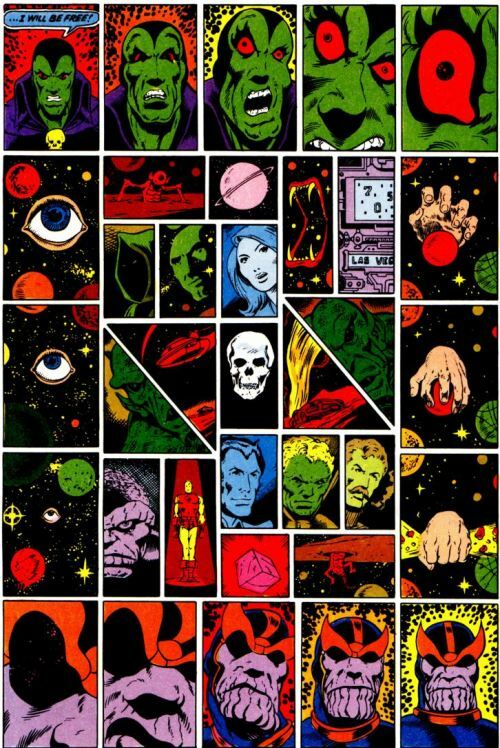 The art from The Stars My Degradation looks to me like a conscious imitation of Starlin. Interesting, and good catch. Inasmuch as that's the case - and I agree - it seems to be on the level of panel framing as opposed to style (which is basically unchanged from Moore's earlier work). 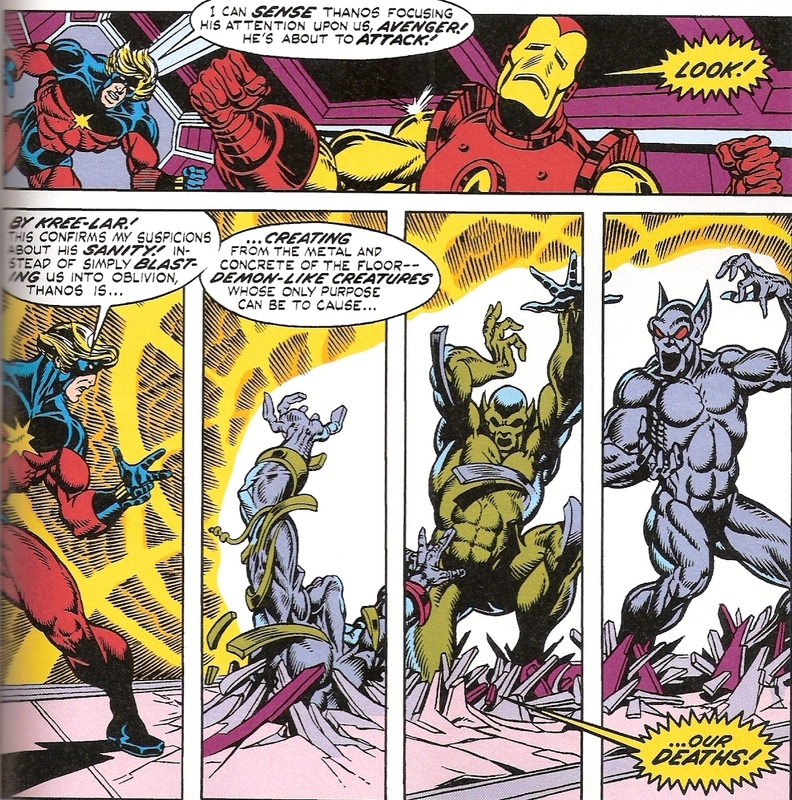 It's got an extended X-Men parody in it, so the Starlin style is likely deliberate as well. We'll see if I have time to bang out a paragraph or two between now and Thursday on it. Agreed for most of them, but I think the first image I linked shows similarity of style too. "Red wine with fish... well, that should have told me something." Is the title a homage to or a parody of the Alfred Bester novel? I say it's a coincidence. That's my story and I'm stinking to it. Terry is my Nation. Oh wait, this isn't the Eruditorum, is it? With Moore's work the line between homage and parody can be fuzzy. My general impression of Maxwell the Magic Cat (of which I've only read a smattering of strips) is actually quite different. Moore is undoubtedly a funny man, and while few of his long form works are strictly comedic, his sense of humor comes across in much of it in some form or another. But he's really ill-suited to the four panel strip format. A lot of MtMC is clever, some of it is passably amusing, but fairly little of it is actually funny. It feels abridged, like Moore is struggling to fit his observations into four panels and noticeably chafing at the limitation. It's not awful, per se, and it's arguably better than much of what gets published in American newspapers (not a huge hurdle to leap over, mind you). But it's not particularly good, either, and if not for its historical interest as one of Moore's formative works, it wouldn't be memorable at all. He frequently had clever plots as well, particularly early on - for instance, a plot in which murderously psychotic cyborg Axel Pressbutton infiltrates an anarchist cell consisting entirely of police informants trying to infiltrate an anarchist cell. Moore got this plot from G. K. Chesterton's The Man Who Was Thursday: A Nightmare (1908). But it's such a brilliant idea that it deserves to be recycled. Just a quick note to say that the pseudonymous Pedro Henry was Moore's longtime friend Steve Moore (no relation). 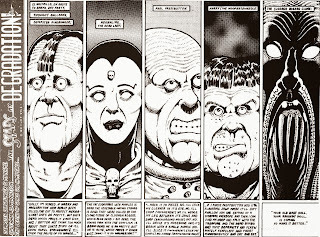 Steve wrote the first appearance of many of the characters from The Stars My Degradation in Three Eyes McGurk and His Death Planet Commandos, which appeared in Rip Off Comix #8 in 1981, which was drawn by Alan.